Have you ever imagined lounging on a cloud of mashed potatoes or sending the fire department to cool down your four alarm Buffalo Wings? With the real life food fantasy that is Thanksgiving coming up, we’ve decided to revisit the edible world of photographer Matthew Carden. 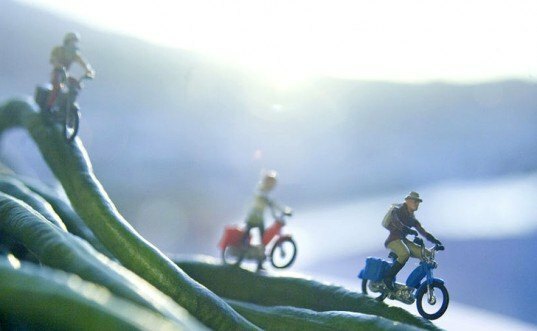 His edible landscapes, populated by tiny people, change the way we think about food, from approaching healthy choices to portion size and consumption. Carden’s “Small World” series closely examines the foods which make up our meals from a bug’s eye view. A soft bend of a tender green beans, the flourish of a broccoli crown or the dense mass of a piece of cheese are transformed into sumptuous landscapes. Each scene is populated and animated by tiny model people, who climb up cheese cliffs, mull through mushroom forests, and travel the rough terrain of a nut roasting pan. Through these photographs of the tiny dioramas, we are able to see and appreciate the beautiful details of the plants that we consume. Carden’s photographs appeal to adults and children alike, casting food in a playful light, which will encourage kids to want to learn about healthy eating. Each day, many of us blindly eat our meals, while working, looking at a computer screen or on the go, without. We distractedly munch away, giving little or no thought to what we’re eating, let alone where it came from. Whether straight from the farm, or prepared by someone else, it is easy to take the foods that we eat for granted, both the bounty and variety that is readily available to us. Matthew Carden’s photographs give us that extra push to be able to see the beauty of our food, and take a moment of thanks. Reminds me of David Levinthals images. Amazing stuff. Great shots, reminded me a lot of David Levinthal, a great photographer and artist. Some brilliant work based on the second world war and cowboys and Indians. Carden’s “Small World” series forces the view to closely examine the foods which make up our meals, from a bug’s eye view. A soft bend of a tender green bean, the flourish of a broccoli crown or the dense mass of a piece of cheese are transformed into sumptuous landscapes. 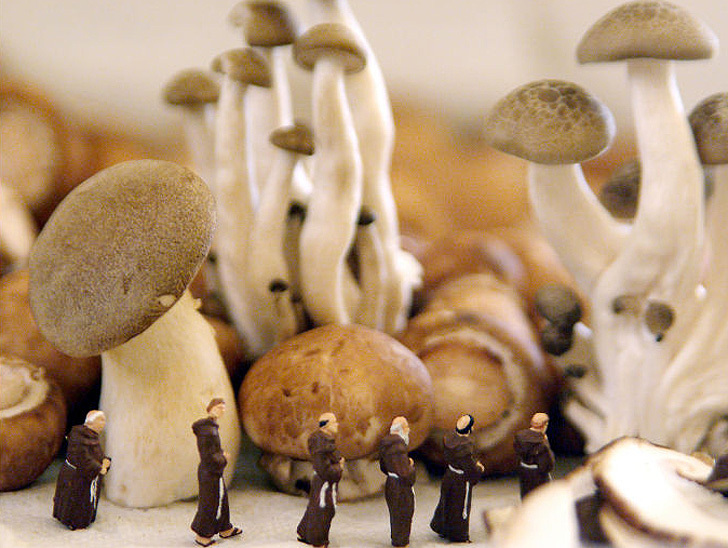 Each scene is populated and animated by tiny model people, who climb up cheese cliffs, mull through mushroom forests and travel the rough terrain of a nut roasting pan. Through these photographs of the tiny dioramas, we are able to see and appreciate the beautiful details of the plants that we consume. Carden’s photographs appeal to adults and children alike, casting food in a playful light, which will encourage kids to want to learn about healthy eating. Each day, many of us blindly eat our meals, while working, looking at a computer screen or on the go, without. We distractedly munch away, giving little or no thought to what we’re eating, let alone where it came from. Whether straight from the farm, or prepared by someone else, it is easy to take the foods that we eat for granted, both the bounty and variety that is readily available to us. Matthew Carden’s photographs give us that extra push to be able to see the beauty of our food, and take a moment of thanks.